"I want to wait for one thing!" Last night I put Lyon to sleep first as usual. But I still can hear Wien talking to her papa from the room. I heard she was telling papa : 等一下，我要等一个东西！(Wait a while, I want to wait for one thing!). I wonder what is that too! Last night Lyon play till 11pm only she doze off. When I stepped out from bedroom, noticed no one in living hall. Hubby went out for tea-chat at mamak stall, Wien went to MIL's room liao. I was happy as I no need to changed for Wien. Later I blog hoping in living hall, while waiting for hubby to come back. But I still can hear Wien talking in MIL's room, wow, nearly midnight liao, yet she still talking so loud in the room. Well, I just keep quiet, if I go to her, sure she will come to my room and sleep with me. After 15 minutes, FIL came out from his room and switch the light in second hall; immediately after that, I heard Wien came out from the room and she thought was me! When she saw it was Gong Gong, she said : 哎哟，是公公喔！(Aiyah, it's gong gong wor!) , then she enter the room again. I heard what she said but still quietly hoop to my notebook, and she does not know I was there...hehehee...I was happy at that time and seem like playing peek-a-boo with her! Later hubby came back, he told me Wien is waiting for something just now. The thing was ME (我就是那个东西！) ! No wonder she came out just now la...Later hubby on the light. She came out again, as she thought this time must be mummy. 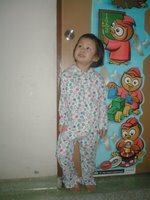 When she saw it's was her papa, she feel very upset, almost want to cry, but she still enter MIL's room after that. I feel it's fun as she did not come to living room or my room to look for me, silly girl. But less than 5 minutes, I heard she was crying in MIL's room, I wonder what's wrong with her! I quickly walk towards her room, and she also came out from there too with her tearing face! Oh, my darling girl, crying looking for mummy. I keep asking her why. She did not answer me. So I ask her sleep with me tonight, then only she stop crying. When I wake up this morning, only know why she cry and look for me last night. According to MIL, she wait for me to come out from room, just want to see my face and say "Night Night" before sleep!!! Arggghhhh...me very bad mummy...lucky last night I get her sleep with me! Few months back, hubby said want to let Wien try on farming (plant vegetable). So I get MIL to get me one polystyrene from wet market. Few weeks ago, in one of the weekend, we started the farming. Wien very excited with it, so does Lyon. 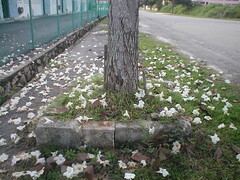 Every morning, before I left to work, I'll remind Wien to shower the plant, else they will die of thirsty. btw, we plant spinach! I think have to wait few more weeks only we can eat the vege! Today is Wien's 4th birthday. Original plan is to have small party tonight, but I change my mind few days ago. We postpone it to coming weekend, if do it today, that's mean MIL has to do most of the cooking preparation, then I will feel guilty. At least in weekend, I can do it with hubby's help. When she wake up this morning, she look for her present. I told her today no wor, have to wait another 2 days. She seem like quite disappointed, keep asking why "jingle bell" (her version of Santa Clause) did not come last night. Usually we will place her present near her bed at night, to surprise her! How she knew today is her birthday? Well, we get her to tear off the daily calendar everyday at night (those big chinese type calendar), then tell us what is tomorrow date and day. She learn numbering from there too! So we told her when she see the calendar show 27, that's mean is her big day tomorrow. 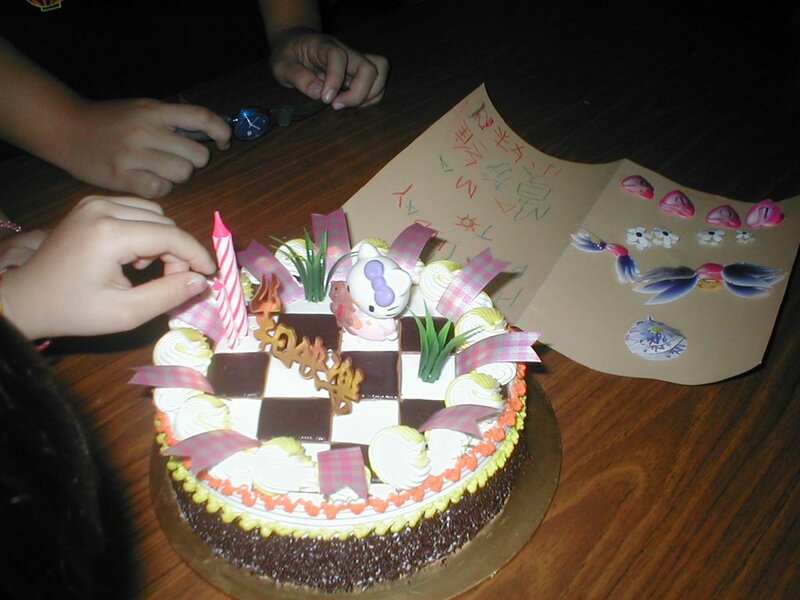 Therefore she knew her birthday since last night, so keep thinking will get present once she wake up! hehehe..pity her! I had made her a card only, she saw it once she stepped out from bedroom. Her expression not as happy as when she got a DIY card from Autie Michelle few days ago ler...becos Auntie Michelle one more prettier and more cute than mine lar....will post both cards later... In fact, both hubby and I not plan to buy her anything, as she has so many toys and playing stuff in the house now, I have problem in keeping them too! But this morning saw her disappointed face, I feel guity and sorry. Today lunch break, must shop something for her! Yesterday I was on 1 day off, be SAHM again. MIL went for her next check up, related post can find here. She had done the biopsy during her last check up, so this trip mainly is to collect her result. Finally the long waiting result is out, it showed the lump is not harmful...phew!! But MIL request for a surgery to remove it. The dr had put in her request in a list first, as according to hin, since it's not harmful, so she still can wait. The hospital need to do surgery for those who in critical condition first. Well, she probally need to wait for about 2-3 months. I did ask MIL whether she want to wait so long or not, else she can do it in any private hospital, but she said she prefer to wait since it's not harmful. Ok, just follow her wish. What a relief when we know she is ok, but now she got another problem, she has high blood pressure! Need to take medicine daily and take care diet too! Morning session I brought Wien to school, to register her for both kindergarten(next year) and primary one. I leave Lyon to MIL, as she only go to hospital after lunch. Wien is happy when reached the school, she saw so many kids there. I asked her want to join them or not? She said : 不要啦！我只是来看看罢了！(don't want la, I just come here to look see look see !) . I told her start from next year you have to go to school everyday, cannot just stay home and watch TV, go to school make some friends and have fun there too! She just nodded her head. Firstly I brought her to see the kindergarten class first. Ask her to remember what is their uniform's color, so that she can 报告爸爸！(report to papa) Later look for school office to do the registration. 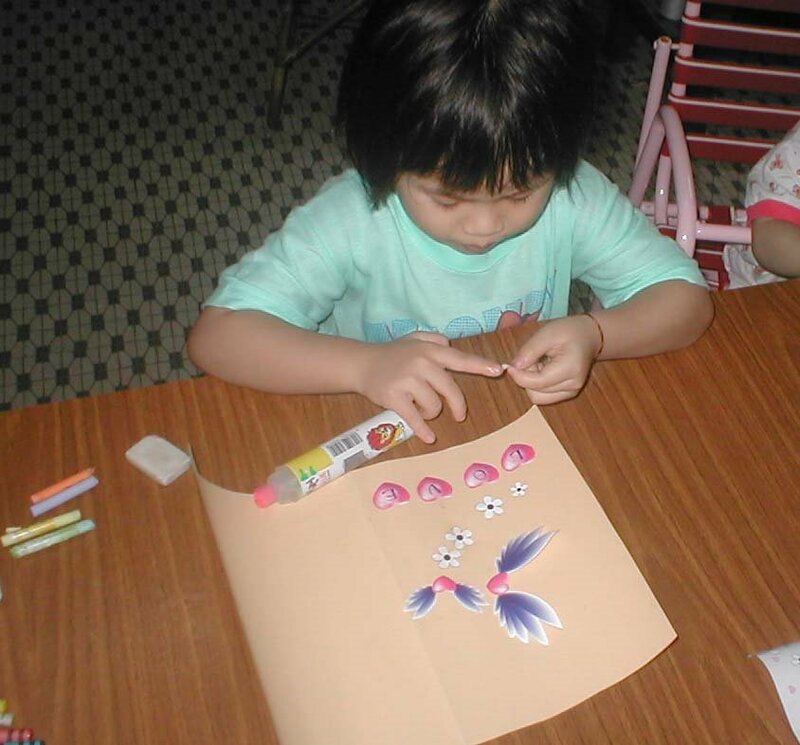 The headmaster said still early to register her for primary one (she born in 2002), come back next year la. But told me to register her for the kindergarten. For kinddy registration have to go another block of building. Wow, very far man, we did lot of walking till both of us sweating, very good exercise indeed! After the registration, I just let her explore the school. 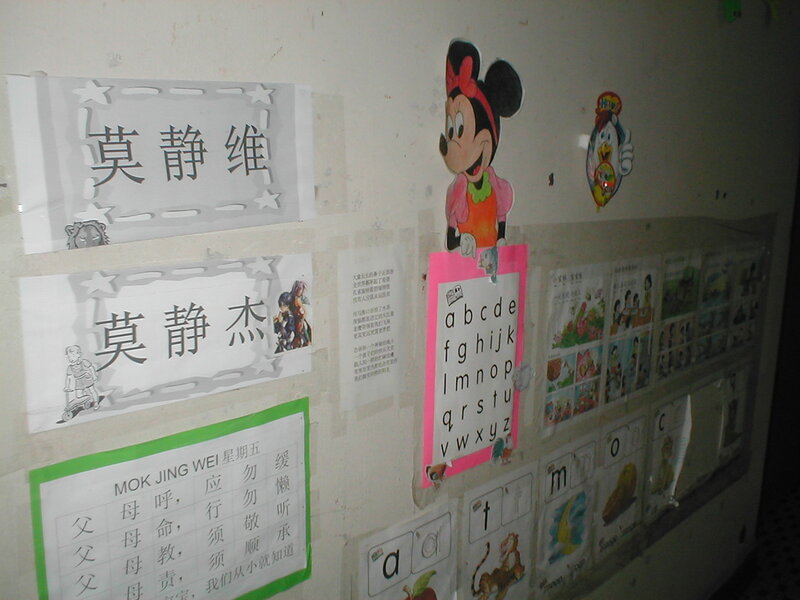 The school's wall full of painting and student's artwork, she like to see too. Walk, stop, see a while...the walk , stop, see again & again! We have a 5 minutes rest in a park, saw many park bench (石膏椅), I love this kind of chair very much during school life! It's so cooling when sit on it. 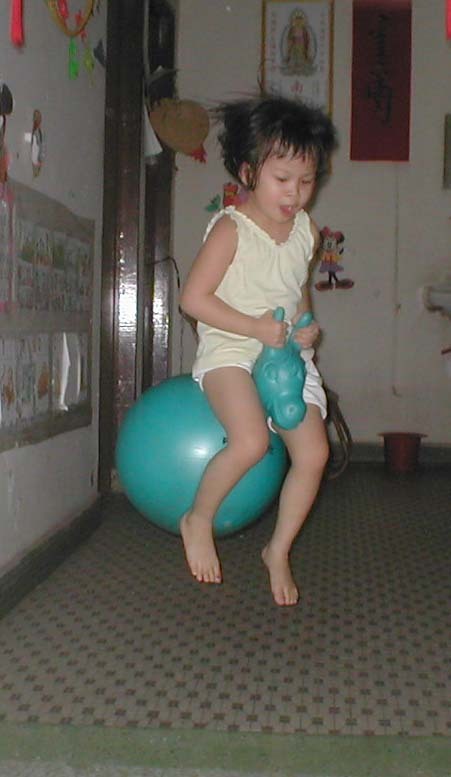 I quickly call Wien to sit on it, after she sit, she said: 很冷咧，妈咪！很爽！(Mummy, it's cool! It's shiok!) We spent abt 1 hour there, then only back to home. After lunch only left me alone with the girls. They nap, I nap too! They have long nap though, I sleep for 1 hour, balance 2 hours I did some house work plus surfing net..hehehe! Whe they wake from nap, it was heavy rain, so cannot go for outdoor activity. 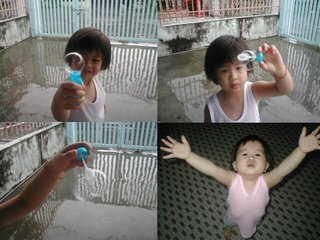 When the rain stopped, Wien request to go outside to play bubble. I give them green light! Lyon so happy when she saw me open the gate, keep shouting :yeah! yeah! This cheeky girl! Overall I love to stay at home with them. Kena tagged by Egghead again. In fact, after saw the tag title in his blog, I have yet to read the content, I quickly scroll down& check will he tag me again. * Sigh * So many questions ler, some more claim it’s fun! Well, I did it too , just to give Egghead some face! Hahaha…. 1. Grab the book nearest to you, turn on page 18 and find line 4. Cosway booklet, so no line 4! 2. Stretch your left arm out as far as you can. Nothing blocking me, as it’s the walkway. 3. What is the last thing you watched on TV? Singapore channel 8’s entertainment program, dunno the program name..*tongue out* 4.Without looking, guess what time it is? 11.00pm 5. Now look at the clock, what is the actual time? 11.15pm 6. With the exception of the computer, what can you hear? Fans turning sound, insect’s sound too..me alone in living hall…. 7. When did you last step outside? What were you doing? Washroom. Wash face & brush teeth, then online do this tag. 8. Before you started this survey, what did you look at? Go Egghead’s blog copy this Qs. 9. What are you wearing? Sleevess T and short pants. 10. Did you dream last night? Bad dream indeed. Dream of SIL#3 was bleeding, worry sick she might miscarriage! (she is pregnant now). I dream a lot recently, some very scary( ever dream of I sit on snake!! ), should stop watching Fear Factor. 11. When did you last laugh? Two hour ago. Bring kids to big field, saw a group of people practice Qi Kong. Both girls come back and imitate the funny look to their Ma Ma. 12. What is on the walls of the room you are in? Calendar and chinese painting. 13. Seen anything weird lately? Saw from newspaper count or not? The Star thumbnails published a picture: a car’s 4 doors use pad lock to lock! Mr Bean is coming to Klang. Really weird hor the car owner. 14. What do you think of this quiz? Like Q & A…is quiz meh? Quiz should have prize one wor! So egghead, are u going to give me any prize for doing this? lol 15. What is the last film you saw? Fear Factor. No see film long time lor. 16. If you became a multimillionaire overnight, what would you buy? a house similar to Bill Gate’s house! 17. Tell me something about you that I dunno. Dislike people 7 morning 8 morning insult my mood! me quite hot temper. 18. If you could change one thing about the world, regardless of guilt or politics, what would you do? Everyone can travel (via plane) without passport! 19. Do you like to dance? Yes! But I don’t know wor! 20. George Bush. talk talk talk non stop 21. Imagine your first child is a girl, what do you call her? Opps, forgot my choice of name now… 22. Imagine your first child is a boy, what do you call him? Never think of boy’s name. My list all are girl’s name. 23. Would you ever consider living abroad? of course! 24.What do you want GOD to say to you when you reach the pearly gates? "Not your turn yet!” 25. Five (5) people who must also do this meme in their journal. - Jazzmint - Zara's mama - Hui Sia - Magictree - Sharon Quickly tag five of you, else kena chup by other liao! Have fun! 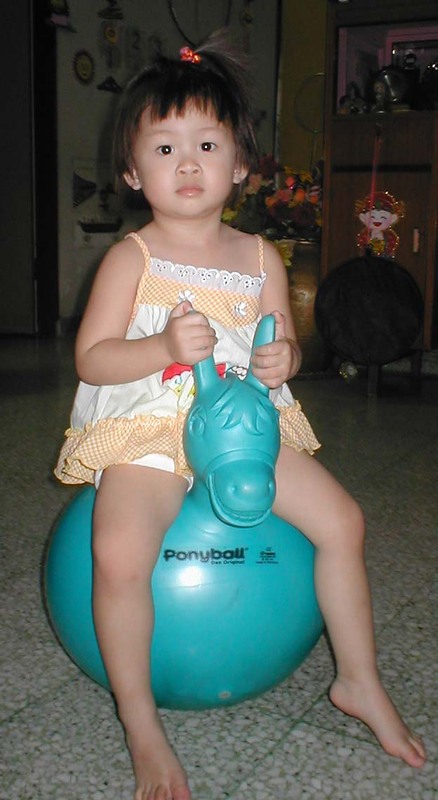 Wien has a Ponyball, she has it from SIL when she is nearly 2. She love to play with it, jumping with it from front to back, back to front! We have to give way, else sure kena bang by the pony! Sometimes when see her so happy playing with it, make want to join too! Too bad, I am too old to play it now! Being kids so good, happy go lucky, can play and eat non stop, no worry at all; sleep when tire, wake up then play again! 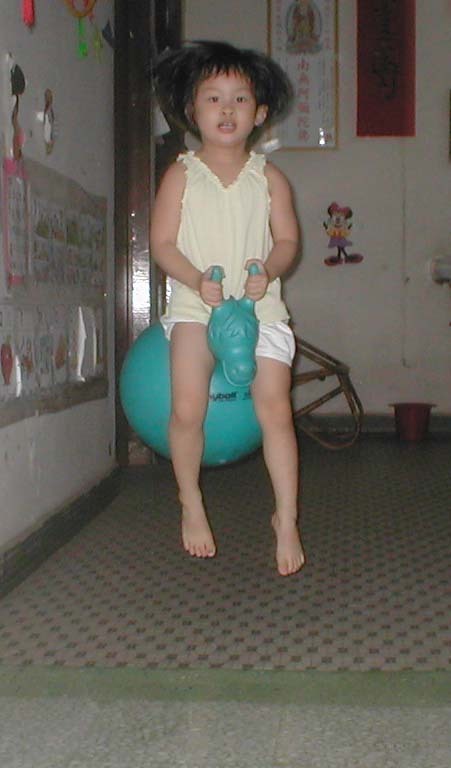 Arghhhh, I miss my childhood! When she is 2, not master the ball yet, so she only sit and walk with it. When she is 3, she can jump even with her feet off the floor! Have not got the chance to snap photo for Lyon with Ponyball yet. Of couse she couldn't jump with it, she need mummy to hold her, then jump with it! Wow....very tired for mummy! I only can accmpany her for short while, else I'll have backache the next day! Great Wall in My House too! 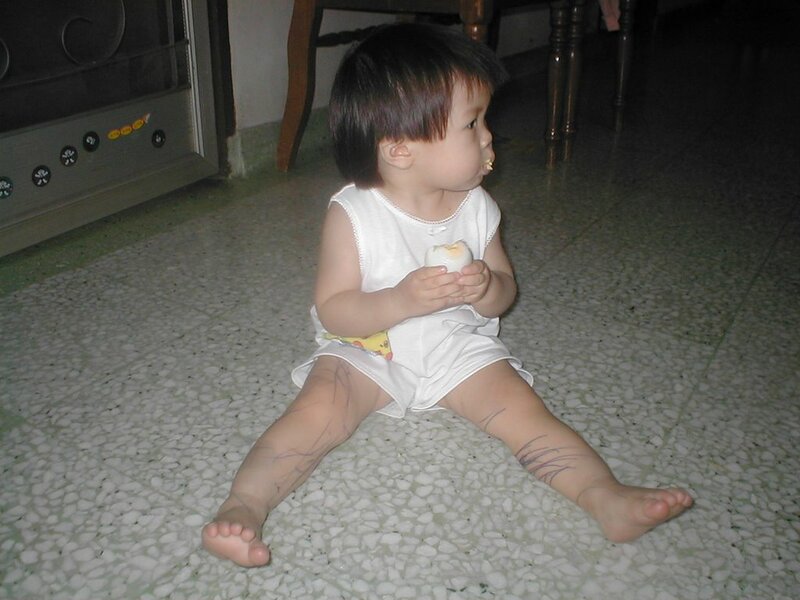 Few days ago, I just blog on Lyon like to write on her legs and body. Some of you commented better dun let them wrote on "forbidden" area. Well, some how it's too difficult to control, they just act too fast! Just like Twinsmom said: It's just 5 minutes only! then her sofa left with some "artist" signatures! Wien is much better than Lyon. At least she never write on wall or on her body when she is at Lyon age now. She only wrote on paper. But few months ago, she marked her signture on my bedroom's wall!!! One day she came and with us. But she couldn't fall asleep, keep mumbling and turning here and there. 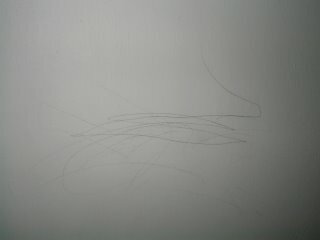 After some time, hubby heard strange sound, turn to her, only noticed she was doing the drawing on the wall!! When she is small, she never did it, now only start it. I hope this is the first time, also the last time. Now Lyon seldom draw there, after few times we warned her, she seem understand. So she go for her legs & hands! The trend was started by my SIL#3, she like to paste her artwork there, just for Wien to see and read. She will teach Wien do the reading most of the time. Well, since she is married now, so the responsiblity had passed to papa. Mummy is lazy bum. Papa will get her to read it loud most of the time. When some paper become torn out, that also mean she had savvy with those reading too! So it's time to change to new thing. The wall of course look not nice for some of our visitors, but who cares? As long as my girls can learn something from it! Lyon even more cute, she always "picks" apple or orange from the wall, and offer it to us to eat! lol...We plan to do the repainting once the girls enter school in 2-3 year time! For cheese lover, you may try this dish; simple, yet yummy yummy! No special recepi, as I just topping the pre-marinated chicken with cheese and chopped garlic! In fact, I invented it after saw Twinsmom's roast chicken and Jazzmint's cheese dish, make me tempted to try on it! It turn out good wor, but I feel lack of cheese, should put more next time! I try with 4 chicken wings first, 2 for myself, 2 for hubby. 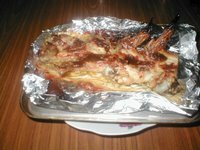 Other family member (including the girls) dislike cheese, so no their share...hehe... Ok, finally managed to post in cookblog ! Happy trying! 15/04/06 is my MIL's birthday, no grand celebration, just small family gathering with some simple dish, of course not forget the cake! Before this I teach Wien DIY 3D card for her Ma Ma. This is the first time I teach her do crafting, before this is my SIL#3 taught her. Well, she enjoy doing it! I do all the cutting as Wien will cut out of shape for those images. She only do the gluing on the card. This card quite simple to do, believe some of you ever did it in your school time! 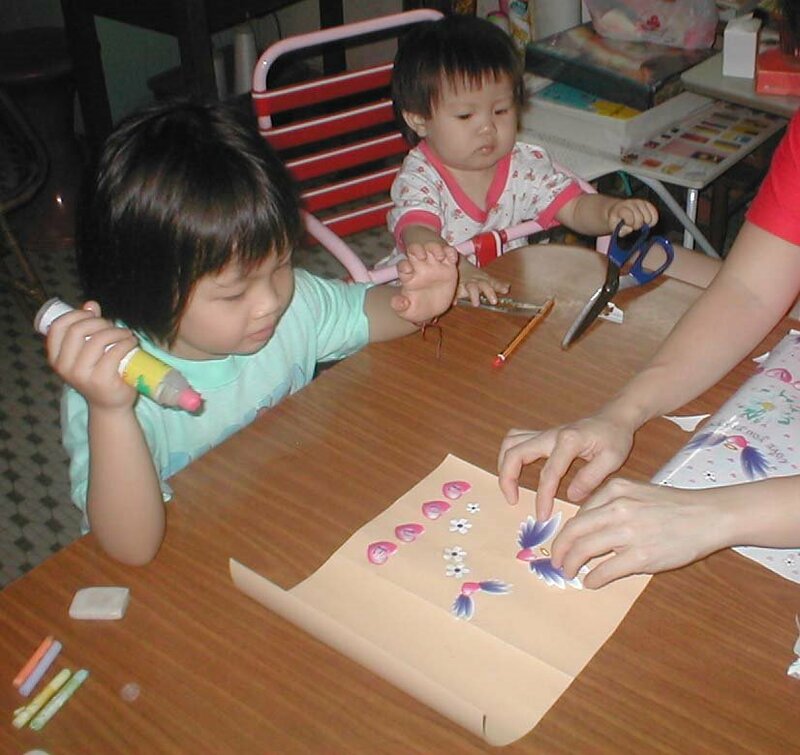 While half way doing it, she keep go & tell Ma Ma that she is making card for her; wanna surprise her also cannot..*sigh* Lyon busy body too, she refuse to be with papa, wanna join us instead! So I get her sit in her high chair, give her scissor and paper, at least can keep her occupied! Dun worry she is holding a scissor with her, as I keep monitoring on her through out the session! After the card is ready, I ask her to write down her name as well as Lyon's name. Later I only found out she wrote as 小妹(xiao mei) instead of Lyon's name. Hehehe...maybe this is easier for her! Wien arrange the candles, seem like she is having the birthday. 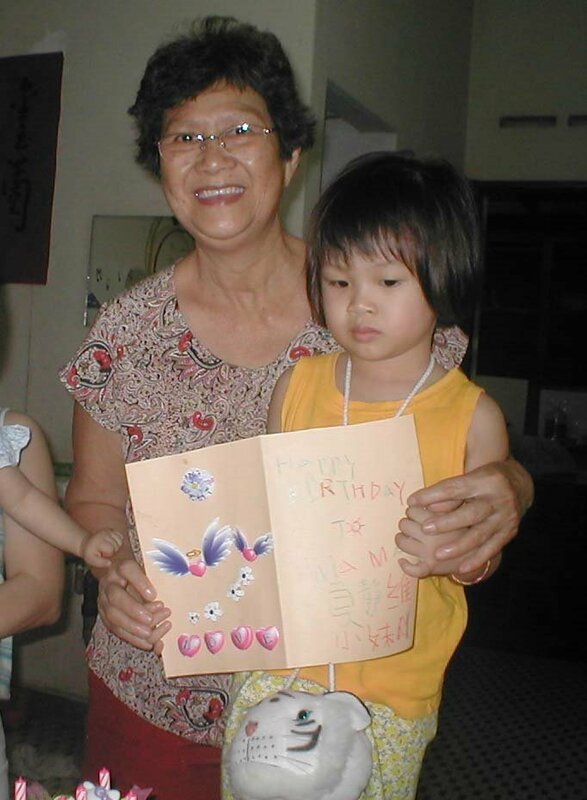 Ma Ma want to take photo with her with the card, but her eyes keep eying on the cake. She seem like can't wait to light up the candle & blow it! 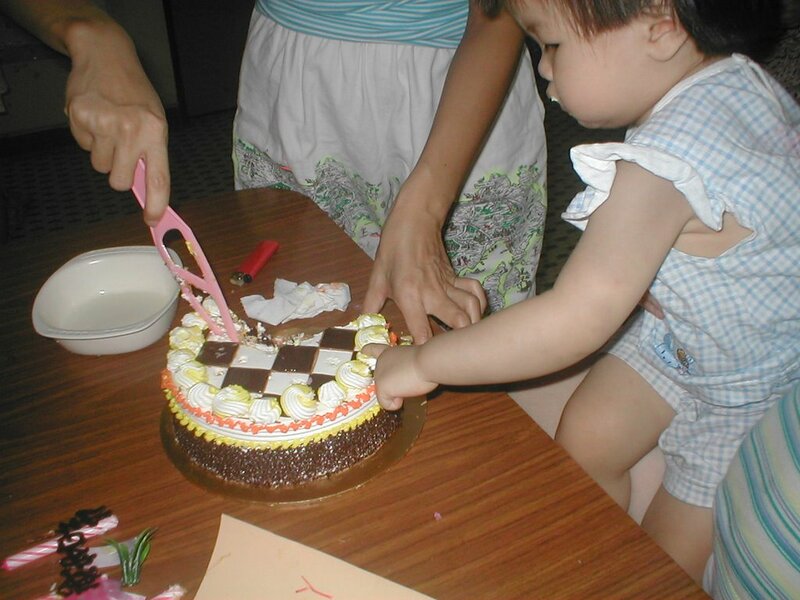 Lyon' s hands keeps wanna touch the cake while SIL do the cake cutting. Let's pictures tell the story.... Lyon likes to use pen nowadays, whenever she saw Wien writing or do the coloring, she would request one for herself. After pass her the pen, she would request for paper. So we just give her and let her 涂涂写写, in fact this will make her sit still for quite some times. But this naughty girl sometimes will do some tatto on her body, especially on her legs. These pic taken when she is 13 months. 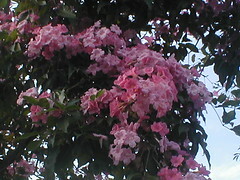 These were taken on 16/04/06. Can see the improvement as compare to previous pic, so many lines and the lines so long too! 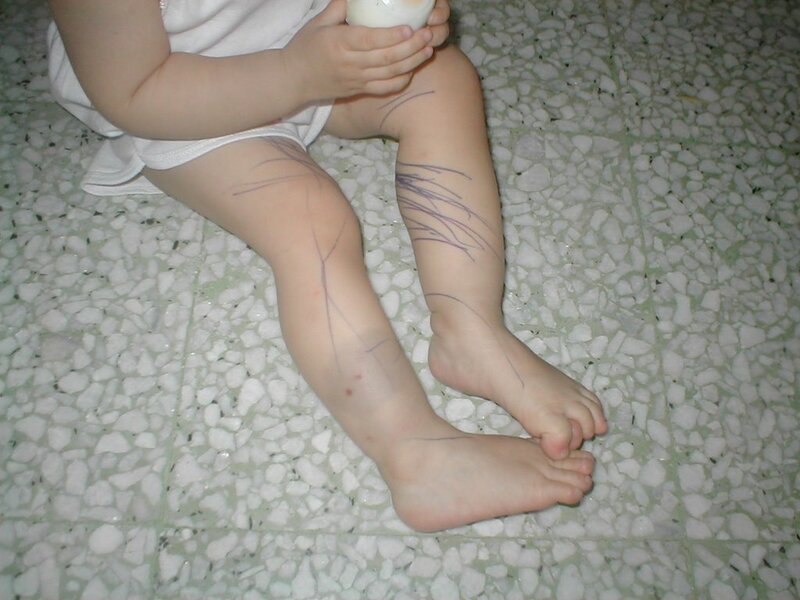 According to FIL, she grab the pen from his pocket and starts tattoo-ing her legs, she refuse FIL to stop her some more! 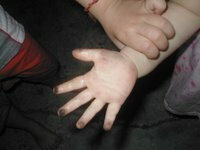 Eeeee, whose hand so dirty?? These pictures were taken at my mum's place. Evening time, I let the girls play at the car park, they run here and there. After some times, papa spotted Lyon's hand so dirty, guess she must be rubbing on the floor. So he wanna snap photo for it. But Lyon refuse papa do so, she keep pushing away papa's hand while papa holding her hand. After few try, still not successful; so papa get Wien to hold her hand. Then this messy girl start crying loud. 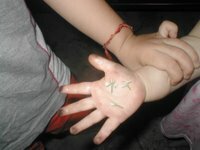 Later Wien put some small flowers on her palm, only she stop crying!! hehe..
Last night I watched Fear Factor again. This is my 3rd time watching this program. Very action and heart attack type of program, also very scary for me. I dunno how to describe it, for those who ever watched it might know! Some series I dun think I can take it, too disgusting for me! They even ask the participant eat the worms. Life worm man, yikes…I almost vomited when I watch them chew (the host said must chew, cannot telan straight) and eat it!! The worms so fat, big & juicy!! Oh my goodness, this American people really can do it for the sake of USD50K!! For the past 2 series, I did not manage to watch till the end. Hubby keep asking me go to bed, as he claimed it’s time bed. I refuse, as the show getting very interesting though, but when come to eating worm part, I give up. Turn off TV and go to bed! Me chicken too! But last night I finish watching till ending, despite my hubby keep chasing me go to bed! So, I chase him to sleep first...kekeke...he seem like scare to sleep alone...Last night series no disgusting part, all action one, so I able to watch till the end! Next Thursday, 11.15pm I will watch again! Dear, dun kacau me then! Note : Meaning that her hands like octopos, keep rubbing here and there. Note : Meaning that she is very talkative. 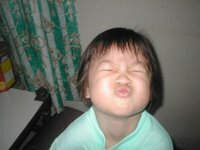 有时真的是又好气又好笑！Sometimes she really make me feel funny and angry with her! 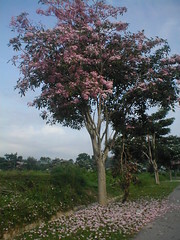 Some places are spring season now(of course not Malaysia! 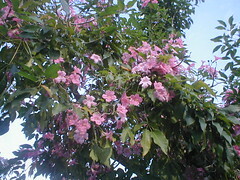 ), many abroad bloggers had posted their beautiful blooming flowers in their blog. 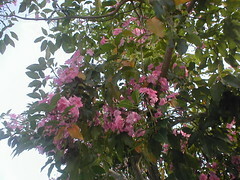 Me too want to share my place's beautiful flower but I dunno the name. 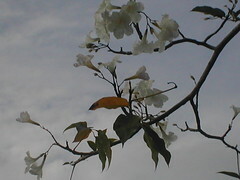 The different is still can see many leaves on the trees! 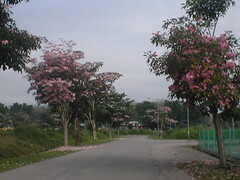 The trees just located outside my factory. In fact only this year I noticed their existence, though I have been working here for more than 2 years! 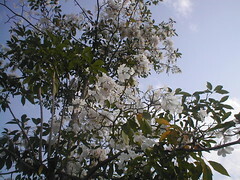 The blooming period also very short, in a few days the flower start scattered away. 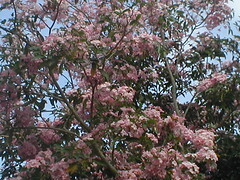 Anyone of you ever see this flower before? My house has many fruit lovers; I can say all of us like fruits, including the girls. 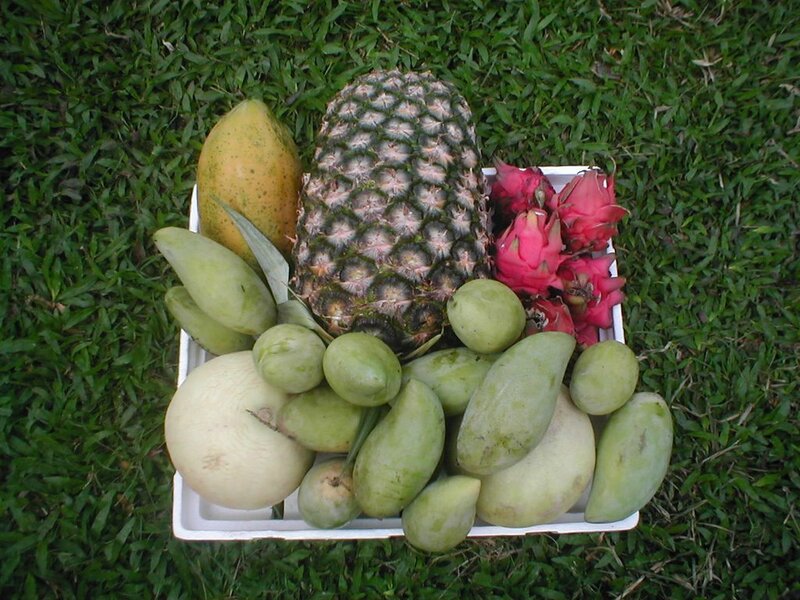 Our fridge or kitchen always can find many types of local fruits, yeah, no joke. PIL really like local fruits very much. They will buy if the stock level is low. They will serve fruits to my girls after each meal too! 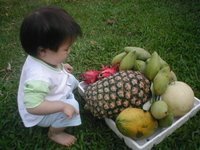 Last time I use to cut fruits for them, but now no need lor, becos my FIL had take over this job, as he like to feed Lyon. He always claimed that Lyon is his Sunshine! Last weekend, MIL back to her hometown in Bukit Pasir, to visit her brothers and sisters. 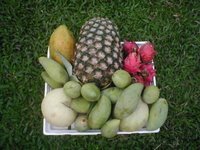 On the way back, she stopped at one of the fruit stall and bought many types of fruits again, there are dragon fruits, mangos, papaya and pineapple. The honeydew shown in the picture was bought by FIL. What surprising me is the giant pineapple! I had seen many big pineapple before but this one looks giant, at least for me! The weight is 6kg, as heavy as a 2-3 month newborn’s weight!! The cost is RM12, just for one pineapple. According to MIL, this is consider medium size lor, still can find some other that look bigger this! FIL like to watch TV news, Wien like to watch cartoon CD; MIL, hubby & myself no any preference as most of them the TV was occupied by them! When come to news time, always can hear this conversation: FIL : 维，公公要看新闻了. (Wei, gong gong want to watch news now.) 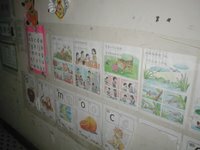 Wien : 不可以！我要看 Magic English. (Cannot, I want to watch Magic English.) 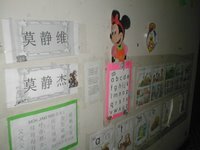 FIL : 你从早上看到现在咧，到我看了！(You watch morning till now lor, now is my turn.) Wien : 我要看咧. (I want to watch ler...) FIL : 你去冲凉先，我看一下子的。(You take bath first, I watch a while only.) Wien : 不要冲凉。(Dun want take bath now.) 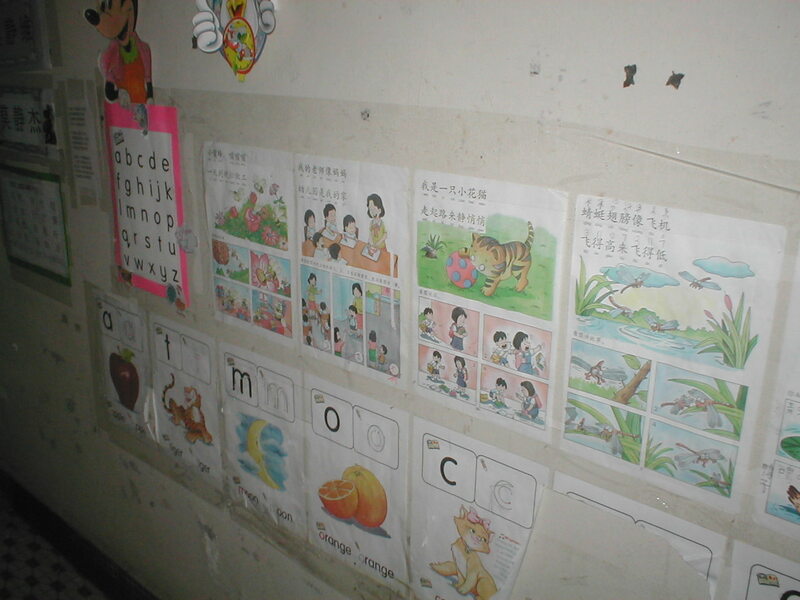 FIL : 快点去冲凉。(Faster go to bathroom.) Wien : N-O (spell out the alphabet)...NO!! Now I have to grab her and pull her to bathroom! Else both will argue non stop! Believe pretty soon Lyon also will join to fight for the TV, mummy headache! During childhood time, my mum will sew pyjamas for us. She like to buy fabric that come with stripe, never never buy those flowery and carton design wan, I dunno why! 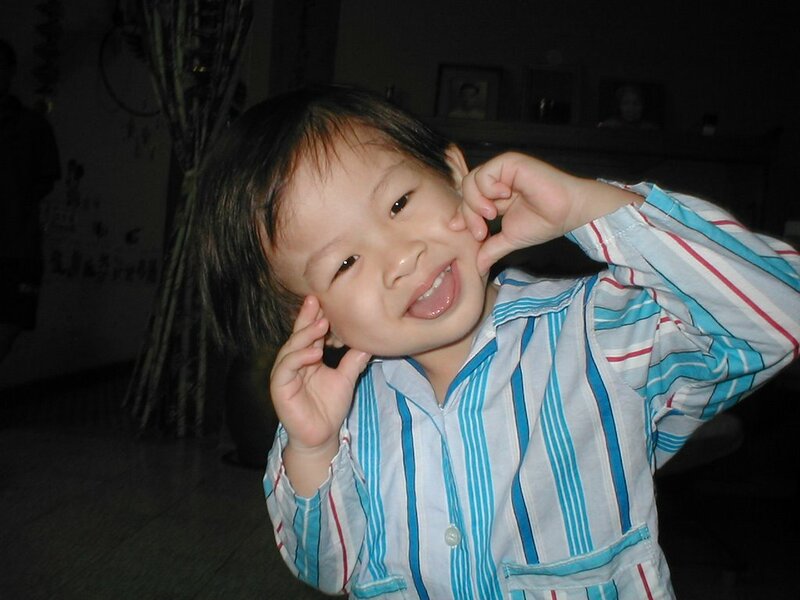 That’s why I use to call this kind of sleep wear as Ah Pek shirt. But we still wear it without any complaint! She never buy us pretty sleep wear, due to poor financial and want to save cost . But she will buy us new dress or shirt during CNY, maybe she worry we might feel jealous if see neighbour kids wear nicely during the festive. I cannot remember since when she stop sewing pyiamas for us; perhaps after she saw us just wear T-shirt and long pants to sleep Now look at my girls’ cloth collection (or even toys collection), I really feel they are so lucky as compare to my time. Yeah, some of you might think: aiyah, dun compare la, now is what century liao!.... MIL has many collection of fabric in her wardrobe, all well keep. I dunno she keep them since when. Since I move to this house I already see those collections. Once a while she will took out some and pass to me, ask me do dresses or shirt for the girls if free. Sometimes she will DIY for the girls too! She uses the stripe design fabric and makes one set sleep wear for Wien. Wien so happy once it is done, wear it almost everyday during bedtime. After the wipe, she’ll tell she wants to wear the Ah Pek pyiamas. 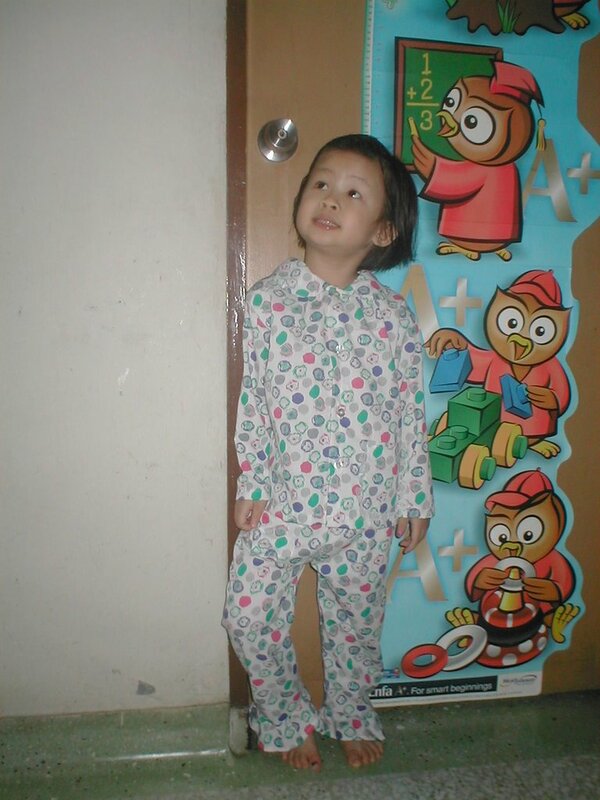 Right picture : Pyjamas DIY by her Ma Ma. I never DIY this kind of pyjamas, as most of the time I will just buy for them. But after see she so happily wearing it, I tempted to make one for her. So MIL dig out from her wardrobe again, found another piece of 100% cotton fabric, she pass to me. The design not attractive and pretty at all, but never mind since this is my first attempt to make it, the result may not turn out good. Just use it as testing. If ok, then only I buy a better design one. After spend few nights, finally the Ah Pek pyjamas is done. I make some ruffle at the pant's bottom, Wien said look like clown (小丑）shirt ler...hehehe...she also love it very much! Now almost every bedtime she will look for it! Left: she posted like a model, although we keep asking her to stand properly... 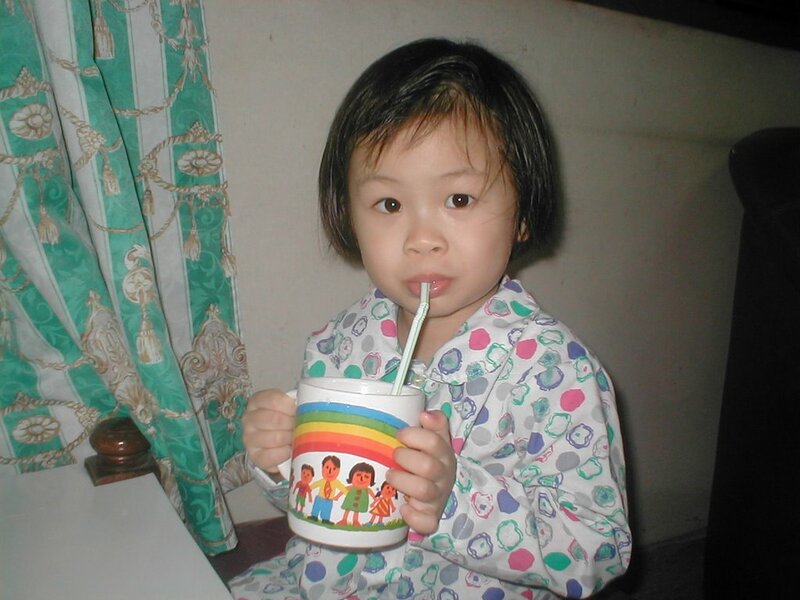 Right: sipping her milk using straw+ musical mug (but no music now, spoil already!) Next I am going to buy cotton fabric and do a pretty pyjamas for her, as one of her coming birthday present!